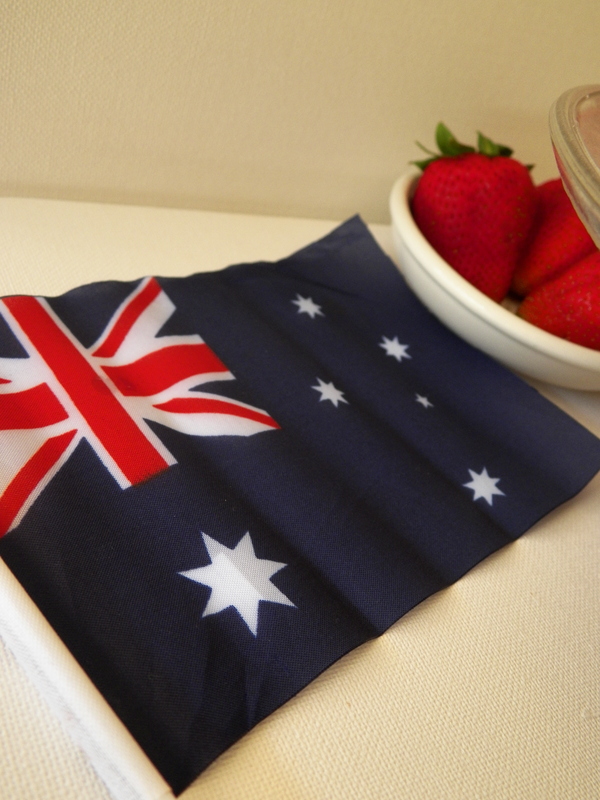 Happy Australia Day to all you Aussies! I hope everyone is having a relaxing long weekend 🙂 As a country, Australia does not really have a defined cuisine of its own. I guess it has something to do with being derived from Britain, and not really having a whole lot of history of our own. However, there is one sweet that we do claim do be our own (aside from the humble Pav, of course!). 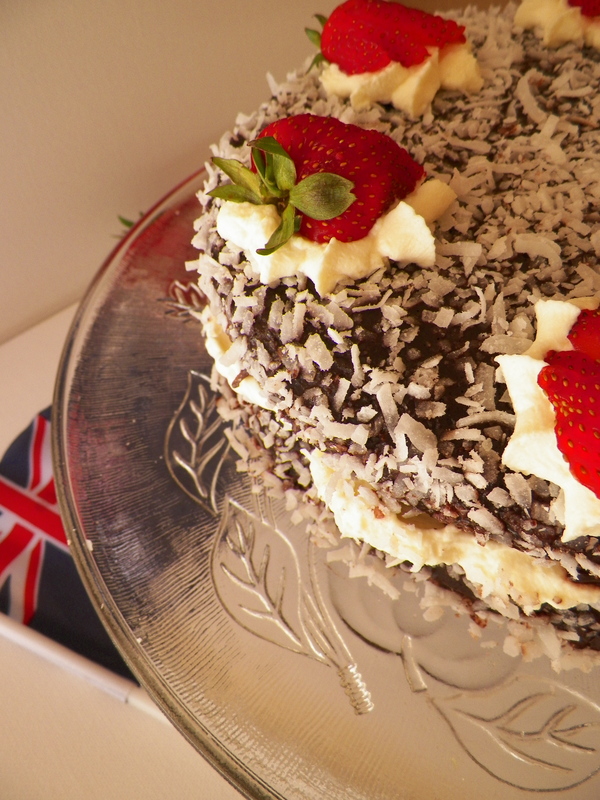 It is the delicious Lamington. 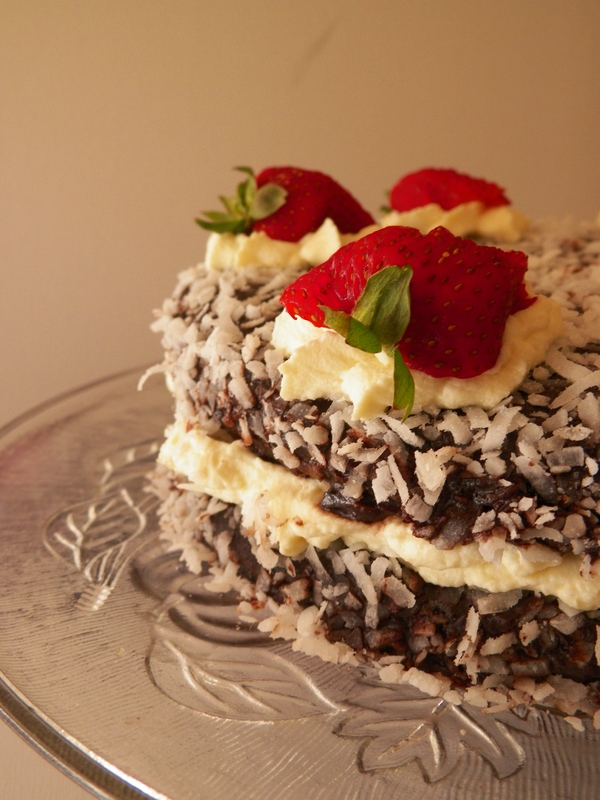 If you do not know what a Lamington is, you are missing out, big time! 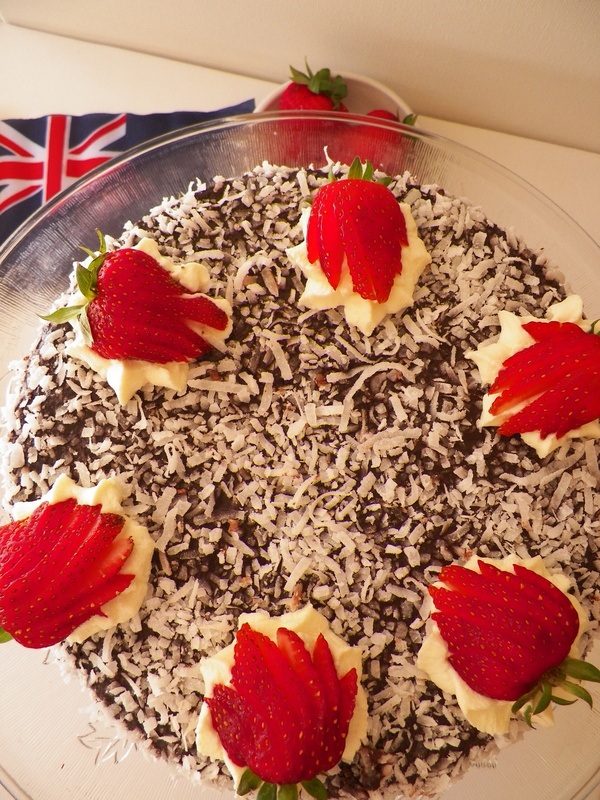 They are slices of sponge-y cake, filled with jam, and covered in chocolate icing and coconut. Yum! 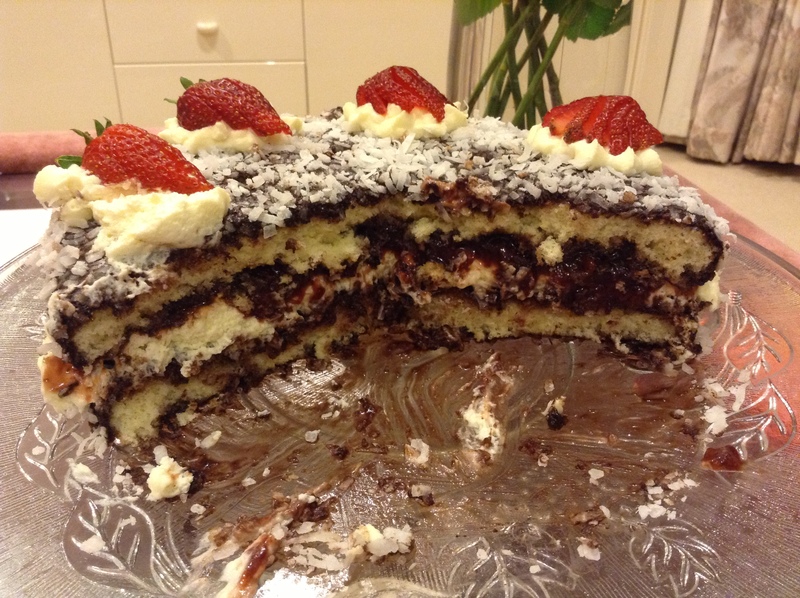 I had actually never made a Lamington before, so I wasn’t sure how it would go, but I decided on a cake version for my Mum’s birthday, and I must say, it was delicious, and a big hit. Preheat your oven to 180c/356f. Grease two 20cm round springform baking tins with cooking oil spray, and line with non-stick baking paper. Set aside. Sift all three flours into one bowl. In a separate bowl, beat all of the eggs, and the sugar, for approximately ten minutes, or until the mixture is thick, pale and creamy. Then, sift half of the flour mixture into egg mixture, and gently fold it in with a metal spoon until well combined. Repeat with the remaining flour. Make sure the flour is all combined as it can be difficult to see in a large bowl – the flour will just sink to the bottom. And remember to be gentle as you don’t want to knock too much air out of the sponge. Divide the mixture evenly into the 2 prepared tins. Smooth the surfaces with a metal spoon to ensure the mixture is even. Bake for 12-15 minutes (mine took 14, but ensure you check at 12). Insert a skewer to ensure cake is cooked – the skewer will come out clean. Leave in tins to cool, then place on a wire rack. Sift the icing sugar and cocoa into a bowl together, and add the water. Mix well until combined and smooth. Pour the icing into a large, shallow dish. Pour the coconut out onto a large baking tray. Place one side of the sponge cake into the icing, cover the sides, then dip the other side of the sponge in the icing. 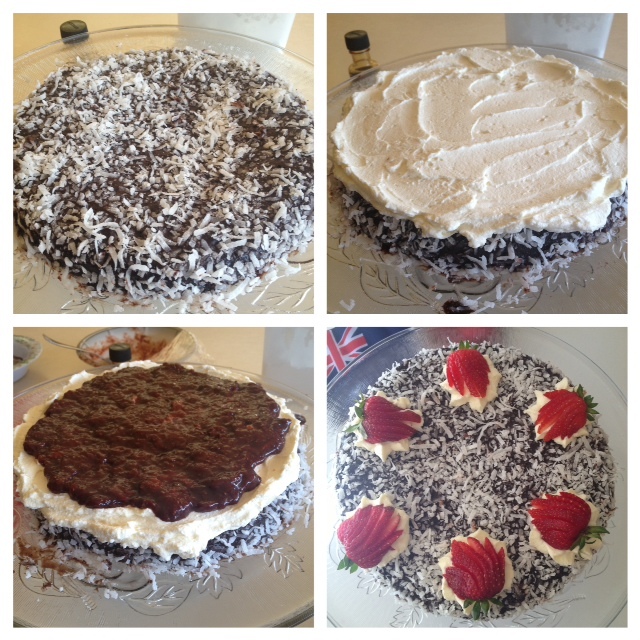 Cover in coconut and place on a large cake stand. Repeat with remaining sponge cake, except place this one on a plate or another baking tray. I found this process super messy and it took me a while, but I got there in the end! Place strawberries and water (I literally used a splash, just to moisten the strawberries) in a medium sized saucepan. Cook on a medium heat until the berries begin to soften (about 2 minutes). Add the vanilla and sugar, and cook over a low heat for about 10 minutes, or until strawberries have broken down. Add balsamic vinegar, and continue cooking on low until mixture becomes a sticky, jam like consistency. Pour into a bowl, and leave to cool. If you are not using the jam on the day of making it, cover with cling wrap and place it in the fridge. I made my jam two days beforehand. Whip up 250ml thickened cream, with 1/3 cup icing (confectioner’s) sugar, and 1 tsp of vanilla bean paste/natural extract. With one sponge cake already on the cake stand, cover with whipped cream, ensuring you spread the cream right to the edges of the cake (if you want to decorate it like my cake, leave a little bit of cream behind to pipe on top). Then, spread over the strawberry jam – although this time don’t spread it right to the edges, leave about 1cm. Place the other sponge on top of the cream and jam. Decorate as desired 🙂 EAT! Mmm that cake looks delicious! That really does look soo nice! I made lamingtons for today too but I cheated and bought a plain lamingtons slab from the supermarket 😛 Happy Australia Day! Thanks very much! I’m sure they’re still just as delicious, April 🙂 Happy Australia Day! your home appear most excellent and beautiful place for living. Animators were able to create drawn art in a computer-generated 3D space, after it was developed for use in the 1999 film Tarzan.